I think a photographic journey to Disneyland will not be complete without a great shot of the Sleeping Beauty Castle. Though much smaller than the Disney World’s Cinderella Castle, this is the original and it’s still an icon. I took these images on the same night as the photographs of the Abstract Astro Orbitor and my previous post of New Orleans Square. Since my kids were tucked safely in bed, I had freedom to go around the park at night by myself. I started around 10pm, but was busy taking photographs of other attractions (such as the Astro Orbitor) and killing time until the park had fewer people — I wanted to get a clear photograph of the castle without a lot of people standing around. I did find out that late at night, the Pirates of the Caribbean and Haunted Mansion have basically no wait, though the ever popular Space Mountain and Indiana Jones still had considerable lines. 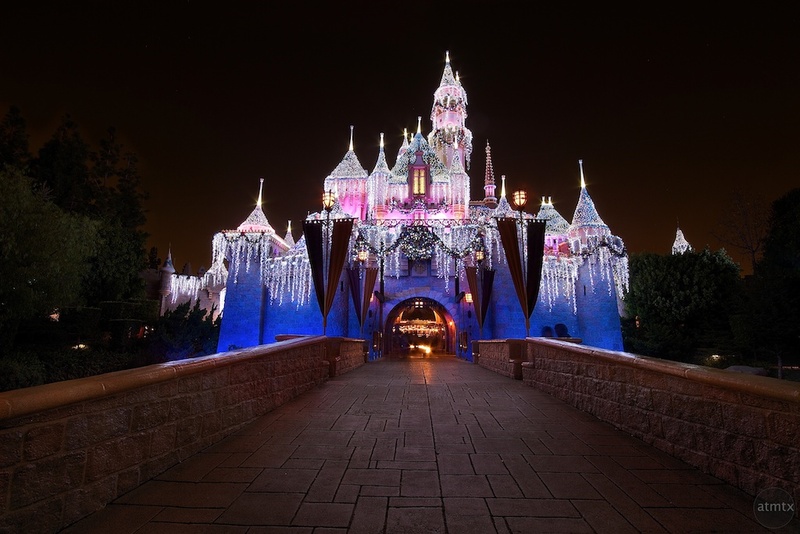 At around 11:30 I headed over to Sleeping Beauty Castle to attempt my long exposure, HDR photographs. Even at this time, there was a steady trickle of people, but it was manageable. Since I was setting up a tripod in the middle of a walkway, I was also conscious of not creating a traffic jam. I ended up taking about 5 sets (3 photographs per set) of photographs of the castle at various distances. Since these were long exposures that lasted anywhere from 10 to 30 seconds each, just taking these 5 sets of photographs took about 10 – 15 minutes. The two images of the castle were the best out of the sets. As I stood further back from the castle, it was harder to take a clean shot without people since many visitors were congregating and taking their own photographs of the Disneyland landmark. Of course the other people had the same privilege as me to take photographs so I feel really lucky that I manage to get the two clean images. I also did end up taking several snapshots of families in front of the castle since a guy with a big camera and tripod is automatically the “expert” photographer. I was happy to oblige, though keeping those point and shoots steady without a tripod is always a challenge, at least for me. I hauled my big Canon 7D and tripod all the way to California to get several photographs that I imagined in my head — a nice HDR of the castle was one of them. The HDRs were created in the same way as described in my pervious blog post called, The Rich Details of New Orleans Square in HDR. In that post, I explained how and why I take HDR photographs. 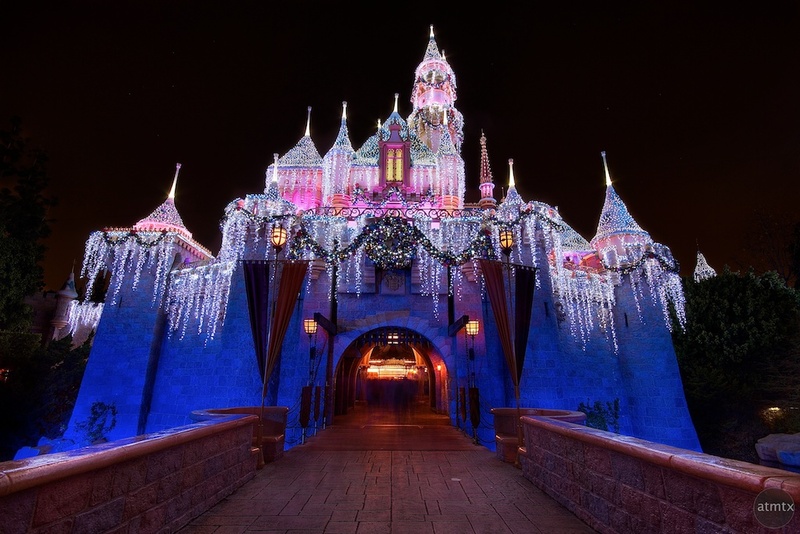 It’s not possible to capture the level of detail and color in the Holiday lights and get the overall light level of the surrounding walkway with a single photograph. The HDR technique balances the light levels and details more effectively. 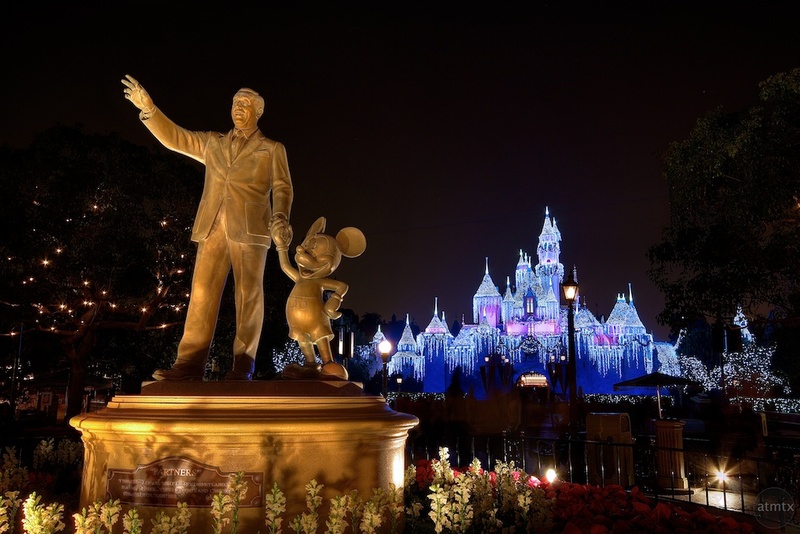 The 3rd image with the statue of Walt Disney and Mickey Mouse with the castle in the background is a perfect example. A regular exposure will not record that rich golden glow of the foreground statue while capturing the colorful detail of the background castle. A nicely done HDR will seamlessly blend these elements. To keep these images looking natural, I use a “light-touch” in my HDR process. Make sure to click on the image to see a larger version. About the only images I wanted to get but could not because of time and scheduling constraints were the Disneyland fireworks. Capturing the castle in HDR with explosion of fireworks in the background would have been spectacular. Alas, even with time, I suspect the park was way too crowded for me to get a clean shot. Someday, I will return to Disneyland off-peak to photograph that scene. I wanted to capture the castle from a few different view points. My largest challenge was to get clean photographs without a lot of people in the frame. Luckily with long exposures, a person can walk though a frame and as long as they don’t stop, they tend to disappear from the final image. The HDRs effectively brought out the fine details of the holiday lights while still preserving the color. It also enabled me to nicely expose the walkways and the statue. Image 1: This is one of the first photographs I took and luckily I didn’t get people in the frame. I wanted the walkway to act as leading lines to the castle. Even though this was taken with a super wide-angle, there is little wide-angle distortion in the castle since I’m relatively far away from the building. Image 2: I used the same wide-angle setting, 10mm, as the previous photograph but this time, since I’m so close, the castle shows a lot of distortion. This distortion is magnified when the camera is not parallel with the ground. In this case, my camera and lens are tilted up to frame the castle which makes the castle look tilted back. If the lens was angled low, then the subject will appear to tilt forward. Image 3: As I mentioned above, I had a hard time getting a wide shot of the castle since more people were getting in the photograph. I decided to go across the street and capture the statue while using the castle as a backdrop. The HDR processing has really brought out the glow of the statue. This is by design. The HDR process tends to make shiny things shinier and makes old things with texture look even older. In this case, I wanted to bring out the golden glow of the statue while still preserving the color and detail of the castle lights. The HDR worked great in this case. The photographs were taken in RAW with the Canon 7D with the Sigma 10-20mm lens. The HDR was created using my standard processing using Photomatix, Pixelmator and Aperture 3. Excellent work here — wonderful HDR work!